﻿Surrender to your blank canvas. Play, let go & allow whatever is to emerge to simply emerge. Join me as we paint every day for 7 days! ​Experience the joys of painting with gorgeous colours for 7 days beginning September 30th ​Register now! I created this course because painting elevates me...every time! I wish for you to experience the awesome feeling of connection with self & wholeness through painting every day! I will guide you with detailed cues to help you begin and support you along your way. This challenge is about finding what moves you, shakes you and brings you joy. Give yourself permission to play, let go, and allow whatever is to emerge, to emerge. So join me as we paint every day! If you are scared, join me. If you have never painted before, join me. If you have painted before, join me. If you are willing to explore unlimited painting possibilities, join me. If you are afraid to paint because you are not an artist, join me. If you get excited at the thought of exploring gorgeous colours and textures, join me. If you are intrigued to quiet your mind and allow your heart and soul to be loud, join me. If you are curious as to how your heart and soul will be made visible onto your paper or canvas, join me. 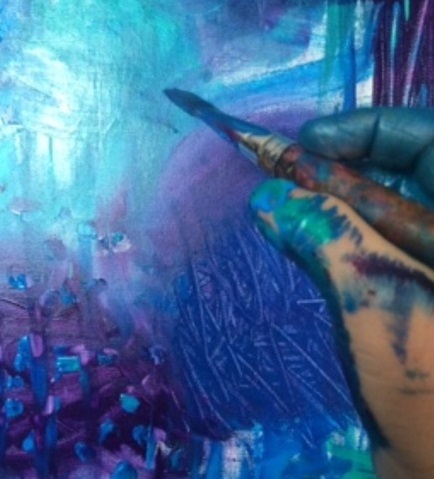 If you are willing to be brave and paint beyond what your mind may tell you, join me. If you are willing to be guided by your inner spirit, join me. If you are willing to be present in the moment, join me. If you are willing to do what we are all meant to do...create, join me. You can decide how simple or elaborate you'd like to make this experience. Using a paint palette from the dollar store and a pad of paper is all you need. Or you can really go to town and purchase canvases and acrylic paints from your local art store. I have a materials list for all your painting needs. What we are all meant to do...create, join me. ​Painting Brings Me Joy and So Much More ~ I Want the Same For You! ​I've been trying to paint daily but sometimes I don't, so join me on this journey and we'll do it together! I absolutely just love how painting brings me joy, helps heal, and relieves any heaviness I may be experiencing whether it be in my body, mind or heart. "Every one on this planet needs to paint!" How incredible would it be if everyone painted? There would be more peace and love in the world for sure! 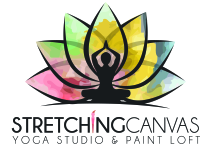 ​I have been teaching process art programs with children through my other business (Messy Hands) for over 20 years and I recently began guiding adults through this process of intuitive painting at my studio-Stretching Canvas. From my many experiences of painting myself as well as guiding others, I have seen how our soul is revealed onto our painting. It is up to us how we translate that to allow for the opportunity to gain more insight or move through a block. I have solved many issues through my paintings. I have released anger, frustration, and sadness into my paintings. Whatever we are working through, painting helps bring us into a more wholesome place. I created this course because I would love you to experience the awesome feeling of connection with your beautiful self through painting too. Allow your painting to help heal & reveal.